We have been in the house for two weeks now and it has been crazy, but also wonderful. There are so many things left to do that I have not been able to glance anywhere for more than a second without focusing on something else left undone. But there have been wonderful moments too, like when the piano arrived although I couldn’t play much at first because I do not play by ear and there are only a few pieces of music I have memorized. But, when I did find some music, I immediately sat down to play. In kicked muscle memory, after a year of not playing, and away I went from the frustration of the move. It certainly has helped now that the packers label the boxes by room and contents. Still, I could not locate the knives and forks. How do they always manage to get those in the very bottom of the last dish carton? Oh my aching back! Hydraulic crane lifting furniture onto the second floor. I missed one of the most exciting moments on move-in day because, of course, I couldn’t miss my writers’ group. 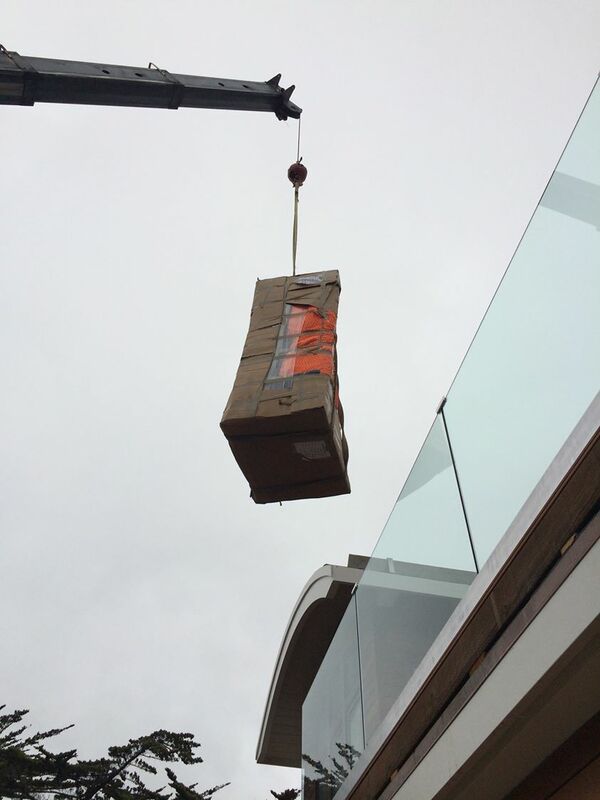 It was the hydraulic crane that lifted our appliances and sectional sofa from the street, up and over the deck railing onto the second floor. But then again, there were things undone: out of eight appliances, on order for months, one still has not arrived and three others were not working after the crane had hoisted them and then gone back to the land of cranes. We had to schedule an appliance repairman to come out a week later and repair them. Most annoying was the stove where the installers couldn’t get the door to open. Allan muttered under his breath it was on a cleaning cycle and, sure enough, when the repairman came last week, he set it to clean and then quickly turned it off and voila! Open, says me, and out the door came, to reveal a shiny new broiler pan without any grease inside. This brings up another worry for me, the cleaning. Yes, already the new house must be cleaned. As a former hotel maid in my high school years (and I could still visit those motel rooms today and hear them cry out for my hospital corners, learned while a candy striper), I can tell you I don’t mind cleaning a bit, in fact I like it. However, when I trail around my dear husband who has never had to clean a thing in his life (thank you, dear departed mother-in-law), it sets up a knot of fear in my stomach for the slow deterioration of these beautiful new things all about us. The sectional sofa is my particular concern. It only cost about a million dollars and was made especially to fit Harry who loves to lounge upon it, because for the first time he feels normally sized. But, he puts his dirty feet up–for he refuses to wear slippers and there is still plenty of sand and debris in a beach house! 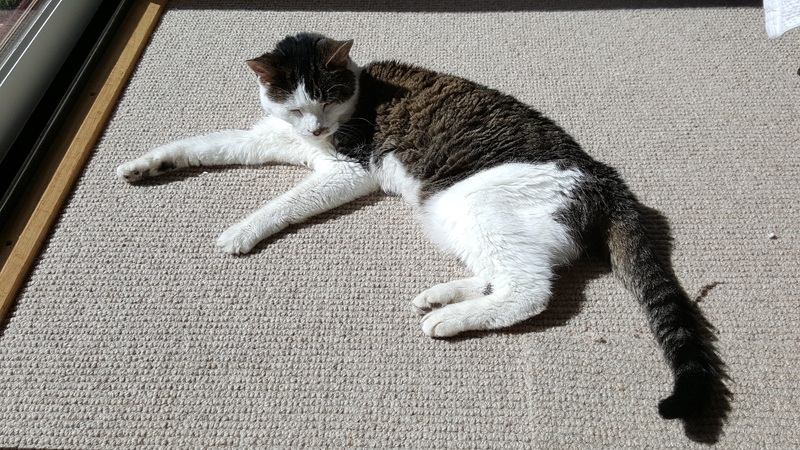 Then there is Alice, our 18 year old cat, just out of the Kitty Hotel, where she has been living for the past six weeks. We have had no caterwauling, no hair balls, and no kitty litter box in all of that time, sigh. But we needed to get her home because she was down to only four pounds. I am happy to say she is eating well, seems to have put on weight, quit screaming and now has the run of the house which of course includes her favorite place, the sectional sofa. After I sat on it last night, the back of my black pants was covered in downy, white cat hair. She has become venerable in my book, however, so I have to relax about it. Still I am ever vigilant in the hunt for how we can keep up the cleanliness lest everything be stained before the parties we are planning for our contractors, neighbors and church friends. I don’t want to wait too long for this because Allan has already disappeared, gone to a new job in Pebble Beach, damn his two-timing heart! I thought it was so sweet when he called the evening that we moved in to ask us if he should bring us a space heater, since the heating system isn’t yet working. He has been back too to install a temporary handrail when he saw I had fallen on the metal brackets that are waiting for the permanent hand rails. But, other than that he’s pretty much gone although his handsome sons are still here working on the back porch and fence. When he stopped by once we told him we had a list of things that weren’t yet finished and he put his hands up. He said, “Don’t even start. I know full well all the things that still need to be done. I can’t sleep at night for thinking about all of them. Wait until I get those done and then present me with your list.” “But,” Harry said, “do you know about the split in the glulam beam.” “You mean the second one from the kitchen on the window side? Yes, I know about that and so does the painter. We’ll get to it. Don’t you worry.” And then he was off again to his new job in Pebble Beach. Sniff, sniff…He was over this past weekend to install the front door lock and fix the fan that was clicking in my study. Instead of going into a frenzied cleaning at the end of that first week, Harry had purchased tickets to the Jazz Festival which takes place over a weekend. 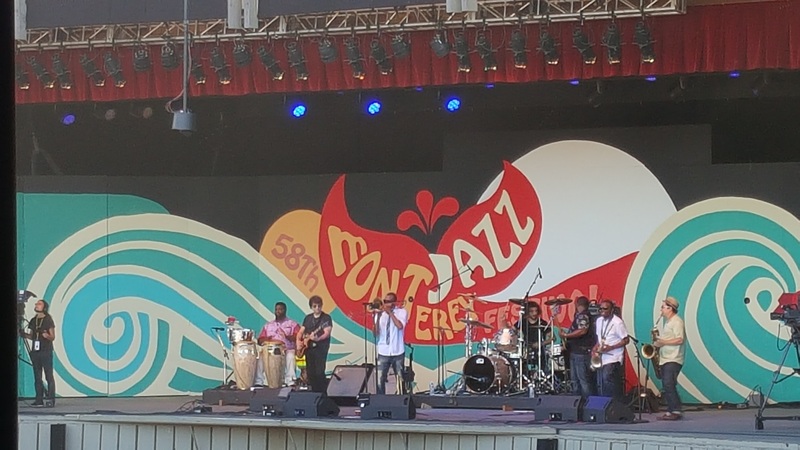 So instead we went to the Fairgrounds, just a half mile away and the next hill over to hear Trombone Shorty who held one note forever through circular breathing using the air stored in his huge cheeks (photo); Diane Reeves with her mighty voice that spans three octaves; Chick Corea on piano playing a 16th Century Scarlatti piece with Bela Fleck on the banjo; and Nikki Hill in her tight black jeans with her band and lead guitarist husband, dressed in high heeled boots and shaking her large afro to the beat of Sam Cooke’s Twisting the Night Away. I had my water bottle with me that afternoon and it was resonating with the sounds, like a listening jar. We came home that night to appreciate the beauteous things about the house– there are so many. The view, the view, the view especially at sunset. On the day we moved in the window cleaners arrived before I got there and had stripped off all the milky translucent coating from both sides of the windows that had been there since they were installed nearly nine months earlier. When I first walked into the house, it was like walking into a glass jar even with the lightly tinted Low-E glass blocking the sun’s UV rays still the views from all sides were crystal clear and each one unique and breathtaking. For Harry’s study windows that face the neighbor’s house, Dan, our landscaper, has even arranged that the vertical gardens were inset into the rock-faced side wall just outside his windows. And the smell! You have heard of new car smell but let me tell you there is a new house smell as well! It smells of wood! And, at the same time it is particularly absent of those old funky smells, the kind that you get in the Tenderloin District of San Francisco, part sewer gas and the other part smell from grime and grit and grease built up over centuries. The house is also especially quiet partly because everything is so solid and nothing creaks or squeaks, but also because every built in cabinet drawer and door is fixed with some type of pressure gauge that doesn’t allow it to slam. All of the careful planning has indeed paid off. But then again, there are the boxes! Full of lanyards, and old papers, and my umpteenth staple remover. It’s the landfill issue again. So box by box we sort through the stuff. We went to San Francisco again and spent the night. 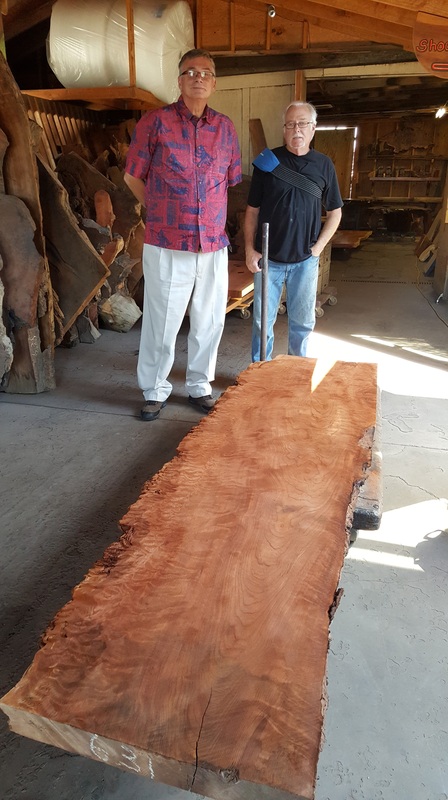 We met Erica for dinner and the next day traveled over to Berkeley to the Burlwood Furniture Shop on Ashby where we met the owner Jim Parodi who, with his partner, has been making burl furniture for 43 years. The shop/factory is in a part of town with other building supply stores right across the street from a place called Urban Ore, full of used things where I had been with Erica on my trip to visit her and bought her a desk. This workshop, only half under roof, is where the trees are brought, cut into slabs, and then made into custom tables, furniture, and carvings and where they even forge metal trim pieces, such as the legs. We listened to Jim’s story about how he got started in the business which has now become an institution in the East Bay. He was recently interviewed by CBS in a story I had heard about even before we knew about this factory. The article was about vandals who had been discovered chopping burl wood out of live trees in the forests. Jim said the reporters came for his expertise, but that he had not wanted his name to be even associated with such a story since his factory uses only fallen trees, most of them street trees from the local area. We came away convinced that this is where we would purchase a coffee table for the living room, it will be beautiful and a perfect use of fallen trees. It will be a rugged piece where Harry can put his feet, or I can rest my glass of red wine without worry that we are harming it. Things were getting sorted at the house. The washing machine seemed to heal itself so we could wash clothes again, Erica borrowed a truck and drove down to pick up her things that had arrived on the moving van from Houston and suddenly there started to be some space between the boxes in the garage. The Streamlife techies were there for days and finally we had TV, and internet, and Harry’s music streaming from the cloud. The back deck is nearly done, the fence is going up, and we purchased planters and boulders for finishing touches to the landscape. Taking a break again from unpacking the boxes last weekend, again Harry had purchased tickets this time to hear Philip Glass, himself, and two other pianists play all 20 of his etudes. 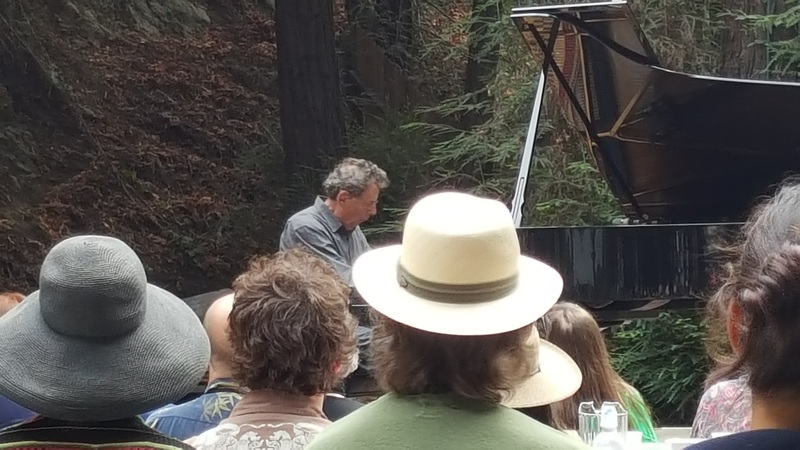 We took a bus down to the Henry Miller Library in Big Sur and there, under the redwood trees we had lunch, sipped wine, and listened to three hours of music that was sublime. My mind was empty save for the music which filled me to the brim, while colored lights played in my mind. It was a glorious afternoon and we went home prepared for the next week of painters, and roofers, appliance repairs, guard rails, and most importantly, the final inspection! 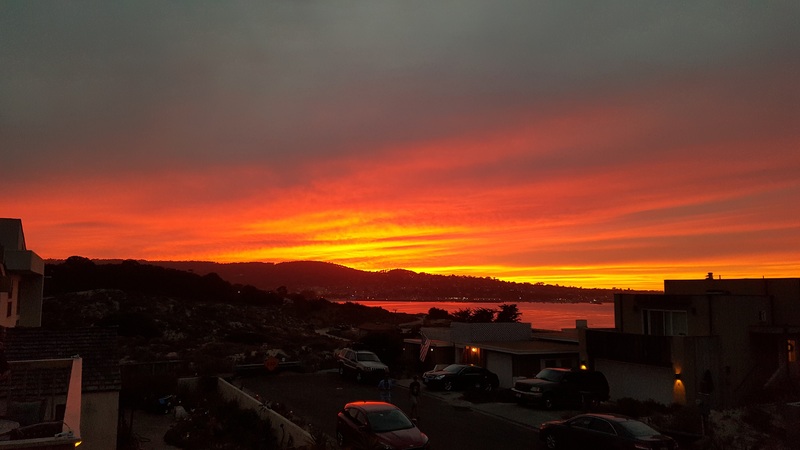 This entry was posted in Uncategorized and tagged Allan Aasen, appliances, Arek Aasen, Artisan Burlwood Furniture, Bela Fleck, Berkeley, boulders, candy striper, Chick Corea, Dan Finklea, Diane Reeves, door locks, Glulam Beams, Greg Aasen, handrails, Henry Miller Library in Big Sur, housecleaning, hydraulic crane, Jim Parodi, Kitty Hotel, landfill, Low-E glass, Monterey Jazz Festival, Nikki Hill, oven door stuck on cleaning cycle, Pebble Beach, Philip Glass, planters, redwood trees, San Francisco, sectional sofa, Streamlife, Tenderloin District, Trombone Shorty, Urban Ore. Bookmark the permalink. We are so happy you made it. Welcome in your new home. It sounds great and we are very thankful, that we, thanks to your hospitality, are able to picture the view, the view and the view again and the rooms and the whole setting. Have a wonderful life in your new house.